Kim's Kitchen Sink: Analytics Update! I've decided to check in a little more often with my Analytics. It's fun for me - I like finding out vaguely where you all come from and speculating how many of you found me at random. I don't get a ton of comments on this blog, so the Analytics gives me an idea of how many people are actually reading this thing. The Numbers: Short and sweet, here's the numerical overview of last month's activity (click to enlarge). How You Found Me: It's a pretty even 3-way split. 40.46% of you are "Direct Traffic" which I think means you typed in the URL or clicked the link in your bookmarks or whatever. 38.7% were referred from other sites - so hooray and thanks, people, for linking to me in your sidebars and such...and thanks to the readers on those sites for clicking through to my blog when I leave comments and whatnot! 24.67% of you found me through search engines. Thanks to Grad Girl, Miss Jane, and Le Blog D'Adrienne for referring the most people! How Many You Are: Last month, I officially had 304 visits, with 216 of those being "absolute unique visitors" (aka different people on different computers). That sounds like a lot to me. 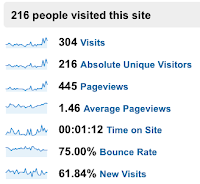 Out of those 304 total visits, 61.84% were new visitors, with 38.16% being returners to the blog. Fancy graph (click to enlarge)! Do You Bounce: The bounce rate is 75%, which I just learned means that 75% of you are "bouncing" away to other sites, rather than clicking to sites within my blog. That makes sense I guess, since most of my new content is right on the main page, and you wouldn't really need to click through to other pages of mine to find information if you're just coming for the most recent post. Feel free to use the list of labels on the left to look up posts by topic and such though...or use the search box in the upper left corner to search for specific terms and phrases. Average time spent looking at the site is 1 minute 12 seconds. Longer than it was the last time I checked, so maybe I'm writing longer or more interesting posts? Maybe folks are coming to visit less frequently so it takes them longer to catch up on all the new posts? Who knows? Loyalty: Well, 61.84% of readers out there only visited my blog once last month. I'm guessing these are the people who found it by accident and then realized it wasn't what they wanted. Or maybe some of my friends out there only came to visit once over the course of the month. Whatevs. 7.89% of you visited twice, 5.26% visited three times, 7.57% of you visited 15-25 times, and 6.58% of you visited a whopping 51-100 times! I don't know who you are, you 20 people who read my little blog 51-100 times last month, but gee thanks!!! That was a lot of numbers. I'm 3-4 computers in South Carolina, but 2 computers from now on in NYC. (each partition of my laptop's hard drive has a separate IP address, so including my mac, and occasionally my mom's laptop...yeah. sorry to screw up your calculations. and one computer in southeast London was also me, though I think Ben does occasionally read on his own. So there's part of it.